Collaborative Governance is the decision-making process that places the authority, responsibility and accountability for patient care with practicing clinicians. Collaborative Governance is based on the beliefs that a shared vision and common goals lead to a highly committed and productive workforce, that participation is empowering and that people will make appropriate decisions when sufficient knowledge is known and communicated (Patient care Services Operating Plan, 2002). Since launching Collaborative Governance in 1997, much has changed in health care, technology and the evolving needs of our patients and families. In 2010, a redesign effort was initiated to better align the work of Collaborative Governance with the strategic goals of Patient Care Services and the hospital, regulatory readiness and Magnet re-designation efforts. To reflect the scope of Collaborative Governance, Excellence Every Day and Magnet champions are now integrated into the new committee structure. Now all Collaborate Governance members are identified as champions and share the same organizational charge — to influence, communicate and educate. The success of the 2010 redesign with its creation of separate committees on, fall prevention, pain management, skin care, and restraint solutions can be measured by: HCAHPS, safety reports, skin breakdown prevalence survey, and the decrease use of restraints. These results tell us that while we will never, not focus on these issues; we need to find ways to consistently bring together clinicians to address those issues together rather than in separate committees. In 2015 a redesign effort was launched to integrate those quality measures into one committee and to create a new committee focused on the patient experience. Click on the name of the committee to learn more about their work. All of the disciplines in PCS host staff advisory committees. These committees provide valuable feedback to leadership regarding practice issues and concerns, serve as a forum for on-going communication within the department, MGH and beyond and are used to review pertinent clinical indicators of care. The Collaborative Governance Diversity Committee is committed to supporting and developing strategies which transform our work setting into a more inclusive and welcoming environment for staff, patients, and families alike. The committee does this work through the sharing of champions’ stories of their own culture and traditions, as well as through case studies, guest lecturers and journal club. The Collaborative Governance Ethics in Clinical Practice (EICP) Committee is a multidisciplinary committee, which was formed to develop and implement activities and programs to further clinicians’ understanding of ethical aspects of patient care. The work of this committee involves identifying strategies to integrate ethical judgment into professional practice and consultation at unit and organizational levels related to ethical issues in patient care. The Collaborative Governance Informatics Committee is a multi-disciplinary committee responsible for informatics education, identification of informatics issues, and the development of solutions for those issues so that Patient Care Services staff will better be able to support the mission of the Massachusetts General Hospital. Members of the committee will act as resources for initiatives relating to informatics. 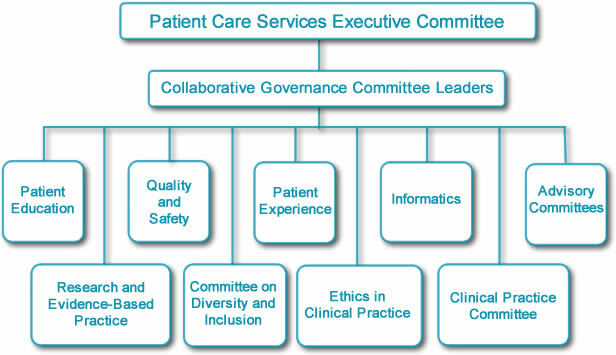 The Collaborative Governance Patient Education Committee is a multidisciplinary committee whose goal is to support clinical staff in developing their role in patient education activities that reflects the diverse patient population served. The committee supports these activities through stimulating, facilitating and generating knowledge of Patient Education materials, programs and systems that will improve patient care and enhance the environment in which clinicians shape their practice. The Patient Experience Committee is an interdisciplinary committee charged with improving the patient experience by advancing clinical excellence through the delivery of team-based, compassionate, patient-centered care. The Committee champions will focus, but not limit, their work to identifying opportunities to improve pain management scores and creating an environment conducive to healing and comfort. The Collaborative Governance Clinical Practice Committee reviews and approves policies and procedures to ensure they are appropriately vetted and evidence-based. Champions review and approve products that are brought into the practice environment, including the plan for product roll-out. Champions should have an interest in influencing how the policies and procedures that guide practice are reviewed and implemented. They should also have an interest in being involved in the decisions to purchase and trial products in the clinical area. The Collaborative Governance Quality and Safety Committee is an interdisciplinary committee charged with identifying actual and potential risks to patients and clinicians through the review of safety reports, quality and safety indicators and the experience of clinical practice. Champions make recommendations on changes to policies, procedures or practice to ensure that care is safe and evidence-based and share best practices with their colleagues. The Collaborative Governance Research and Evidence-Based Practice Committee (REBP) exists to foster the spirit of inquiry around clinical practice. The committee supports nurses in the research utilization process and communicates the results of nursing research activities. We believe that passion and purpose fueled by energizing forces builds great achievements.